At 2:30 am on 26 March 1921, Stillorgan was raided by the military. They arrived in about 40 lorries and armoured cars. The whole area was cordoned off, a triangle from Galloping green to St Joseph's Convent to Thornhill. until 10 am. Ten were arrested, including John and Thomas Carroll, and driven to Portobello Barracks. These 10 were already on a 'wanted list', Thomas Carroll was suspected of having a .32 pistol, he worked as a gardener at Mount Anville. Their older brother Michael Carroll was drowned when the RMS Leinster was torpedoed on the 10 October 1918. His mother Bridget received the war gratuity of £25 and ten shillings the following April. ML McDonell 1 Round ammun. It was the biggest ever loss of life in the Irish Sea. Shortly before 9 a.m. on 10 Oct 1918 the R.M.S Leinster left the Carlisle Pier, Kingstown bound for Holyhead. On board were 771 passengers and crew. Nearly 70% of these would lose their life. The weather was fine leaving Kingstown but rough passage was expected. Just before 10 a.m. and about 16 miles from Kingstown people who were on deck saw a torpedo approaching the port side of the ship, a second torpedo struck the port side where the postal sorting room was located. Some were killed in the sinking. Many died in lifeboats or clinging to flotsam awaiting rescue. The RMS Leinster was one of four ships operated by the City of Dublin Steam Packet Company as both a mail and passenger service. It was a twin propelled ship with paint camouflage and it was armed. 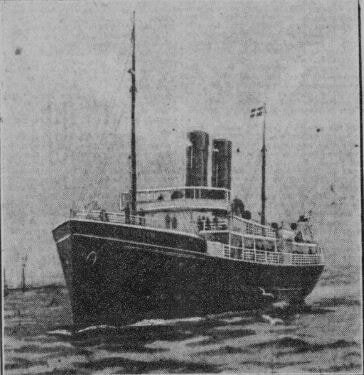 There was a postal sorting office on board, the mail was sent to England by train to Kingstown and sorted on board before arriving at Holyhead and vice versa. Twenty one of the twenty two postal sorters on duty that day were killed. Remains of some of those lost in the sinking of The Leinster were brought to the Carlisle pier. One boat arrived into the harbour with 109 survivors, the dead were being brought in by every boat. Two of the dead from Stillorgan were brother and sister. Letitia Harriet Crawford eldest daughter born 28 Apr 1882 at Birr, Co Offaly living at Stillorgan Cottage, Brewery Road married 2nd Lieut Valentine Hill RFA son of John Hill on 16 Jun 1915 at Stillorgan Church. Her body was never found. Stillorgan Parish Church in 1920. 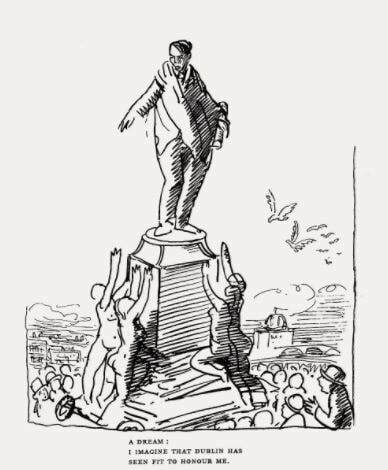 While Ireland, and Dublin in particular was still reeling from the shock of the torpedoing of the Leinster a more sinister situation was brewing. Influenza had obtained a grip on Bombay by the 23rd September 1918 with 427 deaths being recorded. A serious epidemic had broken out at the Johannesburg mines and had spread to Capetown and Bloemfontein by the beginning of October. By this time officials in Dublin realised they had a similar situation on their hands, they identified four deaths from what became known as Spanish Flu. By the 5th of October they had 10 deaths and another 30 people had died from Pneumonia. On the 12th October, just 2 days after the Leinster disaster, it was recommended that Dublin Schools should close. From the 12th to the 19th of October. There were 101 deaths from flu and 58 from Pneumonia. The results were similar country wide. 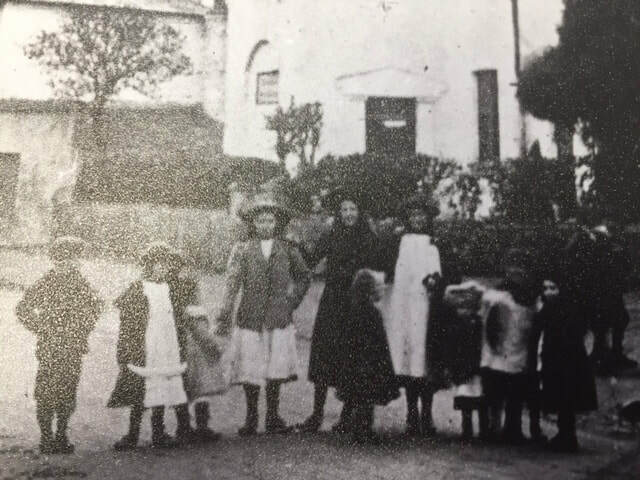 The Rathdown area was particularly badly hit, Dr Raverty the medical officer from Bray pronounced that ordinary methods of treatment were quite inadequate. On one day alone he visited 74 house with 300 cases and had found it necessary to appoint two extra doctors to help him. Dr Judd in Stillorgan had to call in the assistance of Dr Armstrong to help him but they were losing the battle. By the end of October this flu had a tight hold on 43 America states with reports that there were a thousand cases in New York and the 115 of them had died in a 24 hour period. By 8th November the epidemic had abated and schools were starting to re-open in Dublin. It is estimated that 800,000 people in Ireland caught it, and 23,000 died. Spanish Flu in Ireland was responsible for many more deaths than the Easter Rising, War of Independence and Civil War combined. Mrs Jolley - You are a legend! 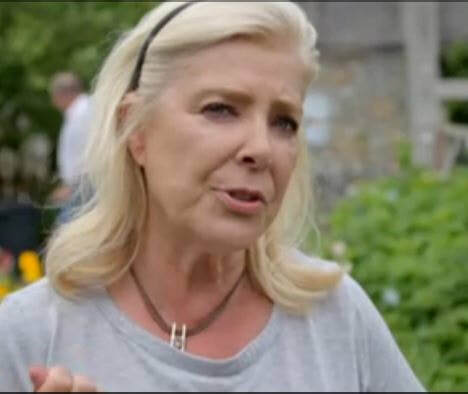 Anyone who has been to school in St Brigid's already knows this but for those who have just watched Grow, Cook, Eat on RTE 1 and want to find out more, it is Available on RTE player - Well worth a watch if only to see "a part" of Geoff making an appearance! 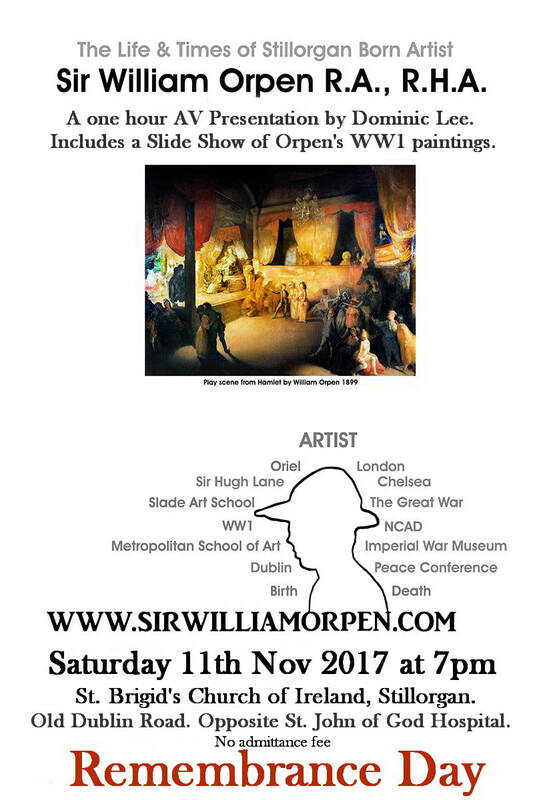 William Orpen Talk on Remembrance Day. Rev Ian Gallager was delighted to have supported this presentation last Saturday in St Brigid’s Church, Stillorgan. There were 80 attendees in spite of the football on TV! Rev Robert Marshall welcomed everyone to the church and pointed out the font which still remains in the same spot, 139 year after William Orpen was baptised there. Dominic Lee gave a fascinating presentation comments like “that’s the best talk I’ve ever been to” and “when is the next one? I want to bring some friends” were heard. Fred Jackson, the grandson of Tom Jackson and Grace Mary Orpen (William’s sister) attended and he too was very impressed. There was no admittance fee but €700 in donations was raised for the William Orpen Sculpture Fund. Julie Parsons has been short-listed for the Irish Book awards, if you've read it, she deserves a vote, if you haven't read it - it's worth reading! it's set in Dun Laoghaire and is about a retired Garda but that is only the beginning of a very scary journey through a town we are all so familiar with. "On Sundays peace was restored. He would lie down, dream and remember. He would enjoy. And later on the bell would ring. He would get up and walk downstairs. He would open the front door. And his life would come to an end . . . In seeking the truth behind both crimes, a web of deceit, blackmail and fragile reputations comes to light, as McLoughlin’s investigation reveals the explosive circumstances linking both crimes – and dark secrets are discovered which would destroy the judge’s legendary family name." A chance to visit Stillorgan's oldest building for an Audio Visual Presentation on Sir William Orpen. 11th November at 7pm at St Brigid's Church, Stillorgan to coincide with Rembrance Day. I feel I can talk with you directly because you came into the Dáil via a byelection during my time as minister for public enterprise. You were bright-eyed and bushy-tailed when you came in and I am glad to see from TV and radio and written media that you remain bright-eyed and bushy-tailed as you put forward your very fine housing programme for the current Government to implement. Did you know that writing letters is in vogue again? I have, modestly let me say, written a book, Letters of My Life. Quite suddenly, letters are fashionable again. So I have chosen this route to write to you about a very serious matter. It’s about libraries. Libraries come under the remit of local government. Therefore it is you who are responsible for the funding for local authorities who, in turn, fund the libraries. A new wave has swept the sector: it’s called a “staffless library”. Now I know that sounds sort of ridiculous. Pilot studies have been taken and results have been annotated in counties Offaly and Sligo. So how does one access a staffless library? You have your swipe card, you swipe it, you go in, you browse, you pick your book, you come out, swipe again and go home. That is your visit to your local library. So what happens when there are staffless libraries? There is no conversation, there’s no exchange of views, there’s no hello, goodbye, how-are-you? There are none of the normal pleasantries that one goes through before you ever get to talk about a book with a librarian. A library is a place of human interaction. It is a place of conversation; a resource much admired and much valued. Why strip it of the staff? I cannot see how this bodes well for the library system of Ireland. Of course county councils have to make cutbacks. We all understand that. But whoever said the cutbacks had to be expressed in the realm of staffless libraries? Whose daft idea was this? Under this new era, let’s say two or three young primary schoolchildren seek the help of the librarian about what sources of knowledge they can consult as part of a school project. In a staffless library, there will be no one there to meet them to answer their their quest for more information. Yes, of course I approve of extended library hours. Who could quibble with such an idea? But please, let them not be staffless extended hours. We are constantly being told that communication is the key to better living, that many young people feel adrift in the modern world of today and feel the need to unburden themselves, to communicate, to be at one with other people. It is hard to communicate in a staffless library. Simon, you have proven yourself to be a politician of substance. I do not say this casually or lightly. I have read your housing programme in full and it makes a lot of sense. My hope is that you will be left in your particular position right now to fulfil it, or at least to put it on track where no one can come back from it. Of course, you may be called to higher things if the rumblings we hear about An Taoiseach and you are one of the two or three in the fray to succeed him. Don’t be in any rush to do that. Keep to your task at hand, which is your housing programme, which is so much needed throughout Ireland and which will be a lasting monument to your sterling work in that field. I have a final plea to you: Please do not allow the crazy, idiotic half-formed staffless libraries to continue under your remit. If they do, and if they become the norm, such a so-called innovation will cast a shadow over your record. I cannot believe that a thoughtful politician like you would wish to see his or her record festooned with a badge of the guy who brought in staffless libraries in Ireland. Libraries are important. Libraries are precious. Libraries are wonderful places but we need the staff in libraries so that the full remit of having books to offer to people of all ages; they should remain a beacon for all in our towns, big and small. Now Simon, that’s my open letter for today and it is to you, Simon Coveney, Minister for Housing and also Minister for Local Government (including libraries). Mary O’Rourke is a former minister for education, health and public enterprise. The Minister for Arts, Heritage and the Gaeltacht, Heather Humphreys TD, has today said that the National Archives of Ireland is making final preparations for the release of the 1986 State papers and records. Minister Humphreys has also confirmed that the National Archives’ 1901/1911 Census website has had more than 132 million hits this year, with 2.5 million unique visitors across all the National Archives’ websites. “Our archives are an invaluable resource. In particular, the release of State papers give us an insight into events which shaped this country’s history. The work the National Archives does each year, in ensuring public access to our 30 year old records, enriches our knowledge of Irish history and society and sheds new light on past events. A chance discovery in a Dublin skip and a curious coincidence 40 years later have resulted in a significant historical find including grants of land bearing the royal seals of Elizabeth I, kings George I, James I and Charles I . The collection of maps, grants, seals and royal letters of patent and containing the will of William “Speaker” Conolly is to be donated to the State on Thursday. It was discovered in a skip on Fitzwilliam Square, almost 40 years ago, by three friends out walking. Robert Maharry, Richard Gorman and Ruary O Síocháin investigated the skip after Mr Maharry noticed a “pristine copy of The Irish Times” which had blown on to the ground; on inspection they discovered it dated November 12th, 1921. 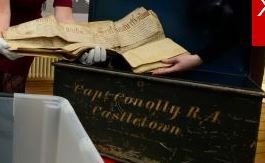 Among the boxes of documents they came across a metal chest bearing the name of Capt Edward Michael Conolly of the Royal Artillery, and the address “Castletown”. Papers in the box appeared to relate to land deals associated with Castletown, in Celbridge, and Leixlip Castle, also in Co Kildare, and other estates, but the men did not immediately investigate the contents fully.